Performers include: Bill Bellamy, Jay Mohr, Fearne Cotton, Louis Ramey, Iliza Shlesinger, Lavell Crawford, Kathleen Madigan, Kali Hawk, and Jim Tavare. In this reality show, talent scouts scour the United States in search of America’s next great comedian. Judges choose ten semifinalists to live in a house together and to compete for the title of “last comic standing,” their own comedy special, and $250,000 in cash. Each week, the contestants compete in challenges to win immunity from elimination. Challenges consist of performing on the street to see who can garner the most money from tourists, giving bus tours of Hollywood landmarks, roasting a fellow contestant at the Friars Club, and performing as a clown to a group of kids. At the end of an episode, contestants vote for who they believe is funnier than they are. The comics with the fewest number of votes perform their routines in front of a live audience. The audience then selects who is sent home and ultimately, laughs last. When the comedians have been whittled down to five, each comic performs a routine and the voting is left to the viewers at home to vote for the winner. Hosts for various seasons of the program have included comedians Jay Mohr, Anthony Clark, and Bill Bellamy. 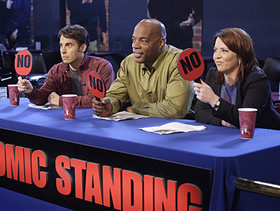 Last Comic Standing: Will the Reality Show Be Cancelled Again or Return for Season Eight? this show shoould not be canselled!!!! !